Q: How long have you been on home hemodialysis? I started training for home hemodialysis in 2003 and officially started in March 2004. I was one of the first patients in Satellite Healthcare’s pilot program for home hemodialysis. In total, I’ve been on dialysis for 17 years (since 2000)! 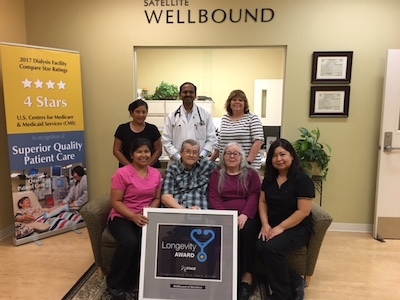 Due to my length of experience on the NxStage System One, Satellite Healthcare WellBound of Stockton was recently award the Longevity Award from NxStage. We had a lunch at the center to celebrate. Q: Was the idea of home dialysis and the training scary? In a way because it was something new. However, Annie and I attended trainings for 4.5 months before starting. By the time we started at home we felt we really knew everything about it. Q: What do you like most about the option of home dialysis? I like that I can do what I want, when I want and at what time I want. My schedule is to dialyze every other night – three nights one week and four nights the next. I have the freedom to dialyze while I sleep or watch TV. Q: How flexible is your schedule with home hemodialysis? Very flexible. Home hemodialysis allows me to live in West Point, California and visit Satellite Healthcare WellBound of Stockton once a month. I enjoy living in the mountains where I can hunt deer, duck and pheasant. I also like to do yard work and fish. I guess you could call me a mountain man. Q: Do you feel the difference between in-center dialysis and home dialysis? Yes, I feel much healthier on home dialysis, and I find myself eating better. My doctor says my labs look great. And my wife says I look better!